Lately I've been reading some of the poetry and essays of Czeslaw Milosz; specifically those essays collected in Legends of Modernity, written during the German occupation of Warsaw in 1942-43, and some of his poetry from the same period. 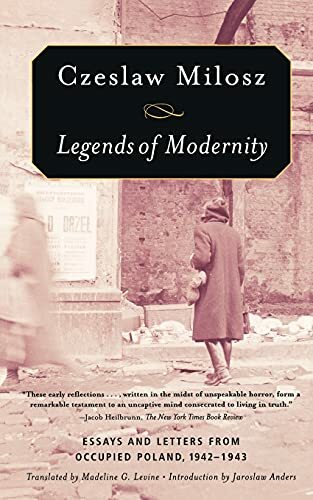 Legends of Modernity is comprised of eight essays and nine letters, the letters being an exchange between Milosz and a friend, also in Warsaw, named Jerzy Andrzejewski. In the essays and the letters, Milosz attempts, using his knowledge of European literary history, to trace some of the origins of the rise of Naziism (which he saw as a European moral/spiritual crisis) and its destruction of European society. The writing is scholarly, often detached, and rarely mentions National Socialism or the Germans specifically. This may be because Milosz saw Naziism as the end result of a long process with many branches to explore. It was also certainly his own way of coping with the horrors around him; as he explains in his notes to the 1996 Polish edition: "It was an attempt at autotherapy according to the following prescription: if everything inside you is agitation, hatred, and despair, write measured and perfectly calm sentences; turn yourself into a disembodied creature observing your carnal self and current events from a great distance." The first six essays were of the most interest to me. In each of these, Milosz discusses a theme ("legend"), from nineteenth and twentieth century European literature, looking for currents of thought and beliefs about human nature that could have contributed to the disaster. He draws no definitive conclusions, makes no pronouncements. He is going through an exercise. "The Legend of the Island," for example, examines the popular idea of the "island" (here the island of Robinson Crusoe) as a place away from other people, where one might realize all one's finest qualities and undeveloped potential away from the leveling and corrupting influences of collective humanity. In "The Legend of the Will," Milosz looks at the "superior man" character, taking Nietsche's superman, Stendhal's Julien Sorel, and Dostoevsky's Raskolnikov as examples of the man who believes his unique strength of will and clarity of vision place him above the rest of society and its morality. "The Experience of War" is the most overtly personal of the six "literary" essays. Milosz wants to understand how "people are experiencing this war internally." He turns to War and Peace and the character of Pierre Bezukhov. Napoleon's conquest of Europe over a century earlier ("innocent" in comparison to National Socialism) stands in for that of Hitler. "Moscow in flames and a crush of carriages on panic-stricken roads are close to our present understanding," says Milosz, and uses Bezukhov's feelings and actions in "an observation of war from the perspective of a civilian participant." The remaining two essays, and the letters between Milosz and Andrzejewski, I confess, interested me much less, mainly because they referenced literary and philosophical movements, and personalities from prewar eastern Europe, with which I'm unfamiliar. Still, the letters in particular were moving--the voices of two friends discussing philosophy and religion while living under the boot of a thuggish regime. on a river of shifting lights and brief shadows. who ever is to blame, O God? The essays try to put mental order in place of chaos, and the poems put words to the grief. Read them both.